I’ve received several requests for updates on the V2 hardware. I’ve had a breadboard version of the V2 sitting on my desk for months. 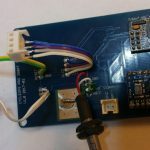 I haven’t yet found the advantages of the ESP8266 processor enticing enough to make new PCBs and deal with the new headaches that will come with trying to get everything working as well as it was on the ATmega32U4. Back to the development on the ATmega32U4, I went off to find a solution to the memory issues. 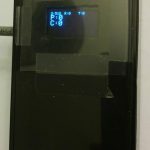 The power meter conversion code is relatively small, the majority of the space was being consummed by the library for the OLED display, while very nice to have it isn’t really needed for the device to function. At the time I was using Adafruit_SSD1306 an excellent library that includes test and image support. For what I was going, text only was just fine. Hunting around GitHub and Google I found the very well designed SSD1306Ascii. While not a drop in replacement for the previous library do the conversion over took me a few hours and memory usage went from close to 90% where I was dealing with random reboot and odd issues to a much more comfortable 44% of program memory being used. Solution found, time to move on to the next issues. I prefer to bike outside whenever the weather allows but with December here on the East Coast of the US mother nature doesn’t always allow for that. 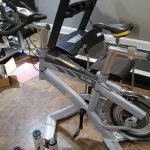 I’ve been using the CycleOps bike with Zwift just about every day and have started to see random spikes of both power and cadence on my plots. This was unacceptable. 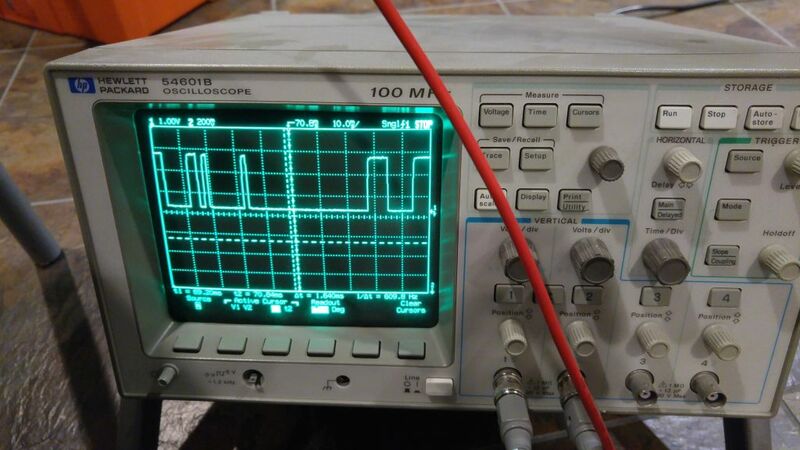 Looking for when a high signal is <1ms I was able to find a packet with a glitch. I’ve received a few emails asking about buying or for help making the Pro300 PT to ANT+ adapter. 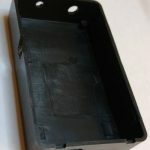 I wanted to be as candid as possible and say that I would like to complete the development of version 2 before producing any more PRO300 PT to ANT+ adapters. 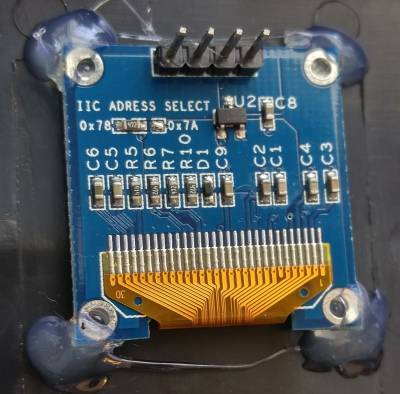 The primary reason for the V2 is to address the limited memory that is available in with the ATmega32U4 processor. As I wrote the current code, The Adafruit_GFX and Adafruit_SSD1306 libraries used to drive the OLED display are rather memory intensive. I found myself resorting to various tricks to get the memory usage of the ANT+ code as small as possible to get the system to run without issues. This did lead me to the neat F() syntax for storing strings in flash memory rather than RAM. With a basic working system behind me it’s time to switch processors and compile all of my learning into the V2 board. I chose to stay within the Arduino ecosystem as the abundant well tested libraries makes development far easier than when I use to work in CCS PIC. The built in WiFi is a nice addition i’m sure I will find uses for in time. I have plans of turning the Pro300 PT into a smart bike and controlling it via FE-C (Torque control method TBD). I have working software on the V1 prototype board without the OLED display but ran into memory limitation as I tried to pull it all together. Leading down the current path of moving to a new processor. This post will be a tutorial to building your own CycleOps Pro300PT to ANT+ Adapter. 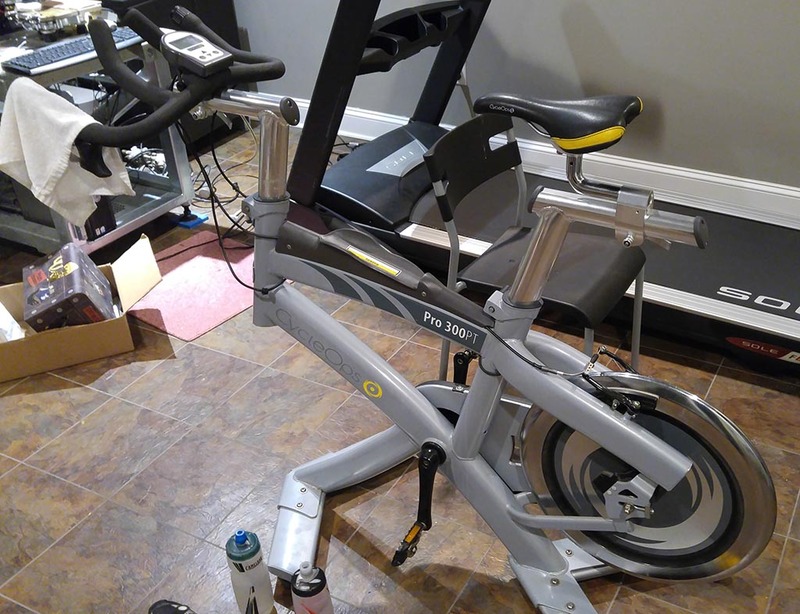 For anyone who may have purchased one of these bikes many years ago and finds it sitting unused in a corner this is a great way to bring new life to your bike for use with Zwift, Golden Cheetah or any other ANT+ compatiable application. If you bike looks like the photo below and came with the computer shown below, this tutorial is for you. 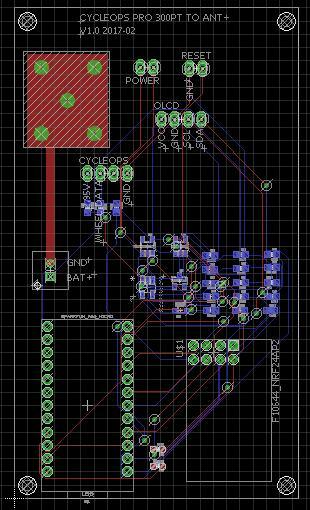 Don’t worry if you don’t, this is a great project to learn on as the PCB has large spacing and is very forgiving in part misplacement. I’m going to take a guess and say for most people this is going to be the most challenging part. I happen to have access to the proper crimping tools for working with Molex Micro-Fit connectors at work. For most, you have 2 options. Cut the existing cable off of your wired head unit or using some needle noise pliers and solder do your best to crimp the pin onto the wire. 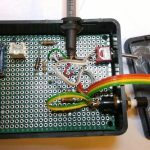 I have used the pliers and solder method for years for a non-mission critical application like this you should have no problem. 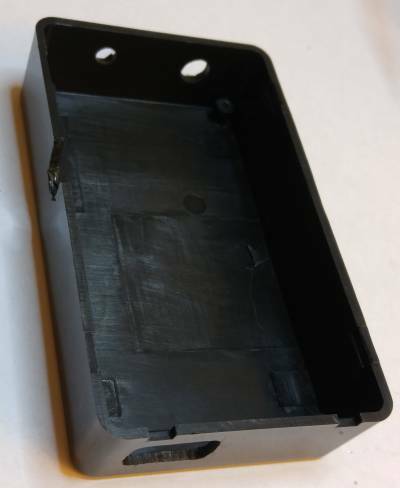 I’m following the pin out numbering as used on the Molex Data Sheet for the 43020-0400 4 pin housing, The image below shows a 6 pin, we will be using a 4 pin version. Don’t forget the heat shrink to keep things nice and clean. The completed end can be see below. Time to take out the solder iron and the 0.015″ solder or some solder paste and hot air and get soldering. 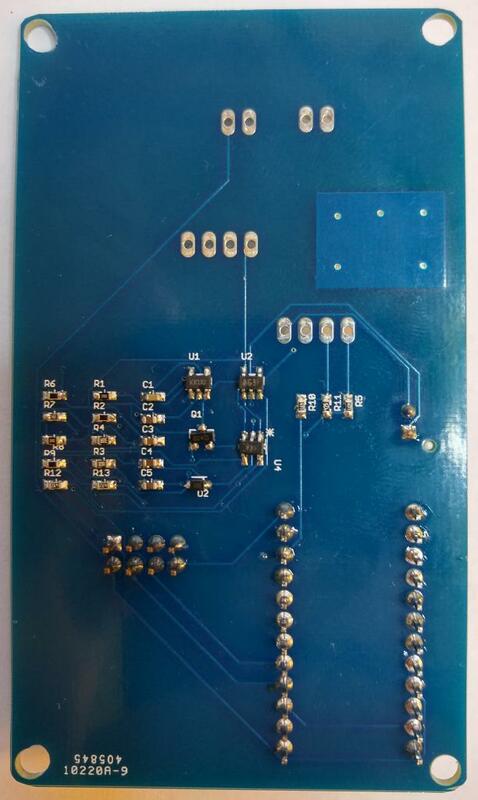 The layout of the board puts almost all of the SMT components on the back with lots of room to place them with tweezers and even enough room to hand solder them if you prefer. I suggest doing all of the SMT parts first then the through hole components after the SMT. Last solder all of the wired switches and data line. I put a small rubber grommet on the line that runs to the bike to give it a clean look when going though the project box. 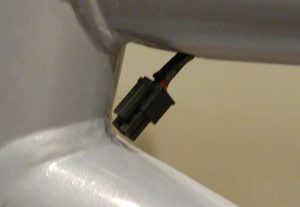 You will notice a large pad just above the connection for the bike data line. I used a cable with a shield. While this pad is grounded and in theory will help protect the wires from radiated noise my primary reason was to use the shield as strain relief for the wire. I didn’t want to solder directly to the OLED display to make it easy to remove the cover and work on the PCB if needed at a later date. I found a Molex 0022162040 to be the perfect fit to the pins and provide a nice right angle pin to solder the wire to. You can see this is the right most picture, its the white connector. The case I used for this project was brought on Ebay Electronic Project Box/ Enclosure Instrument Case. A few modification are required for mounting of the power switch, 0 force calibration button, OLED display and access to the USB port. The location and size of the holes can be taken from the CAD model. 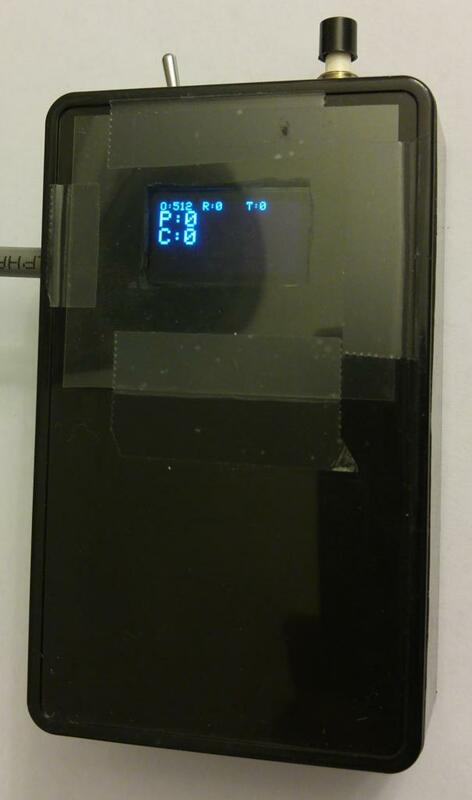 The OLED Display was attached to the cover with hot glue at the 4 corners. I then put a sheet of transparency plastic on the outside to protect the OLED from the inevitable sweat that will fall on on it. I held the plastic on with some scotch magic tape but really need to find a cleaner solution. Upload the code and apply power, on power up, even if not connected to the bike the OLED display should look like this. If anyone is interested I have 4 extra PCBs that I would like to sell for $5 each, PayPal would be ideal method of payment. If interested let me know in the comments below and I’ll get in touch. 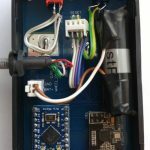 I’ve received a few requests for a step by step tutorial on how to build the circuit that I had talked about below. Sorry, this post won’t be that step by step guide but it will provide many of the tools. 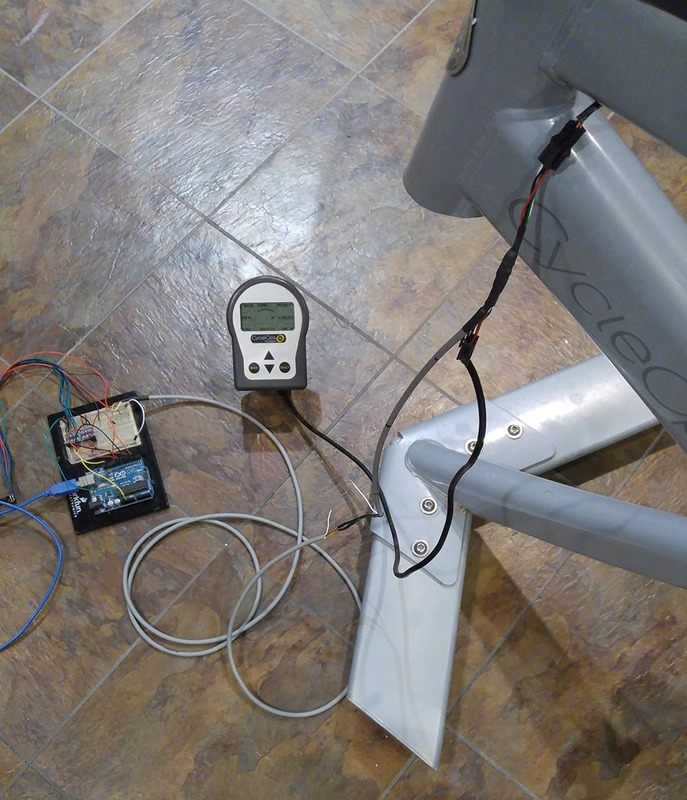 As a mid stop on my way to making a robust design others can copy I built a battery powered, hand wired, point to point monster that I could keep connected to the bike for my own personal winter training. 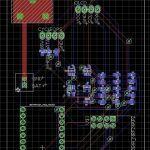 At the same time I drew up the electrical schematic and laid out a PCB that would make it easy for others to build at home without doing painful point to point wiring. I had a few requirements for the finial design. 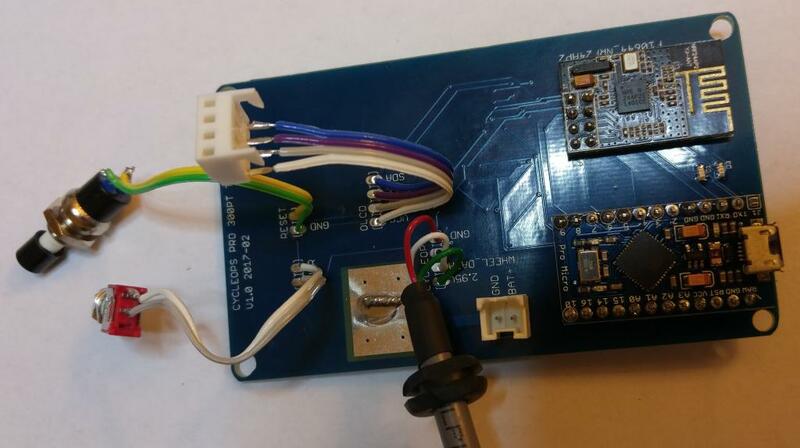 USB programmable for firmware updates and general messing with it at a later time without needing to use an In-Circuit Serial Programming (ICSP). 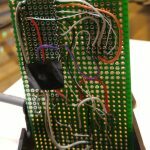 Display: I chose to use a small 128×64 OLED display that I had been playing around with. 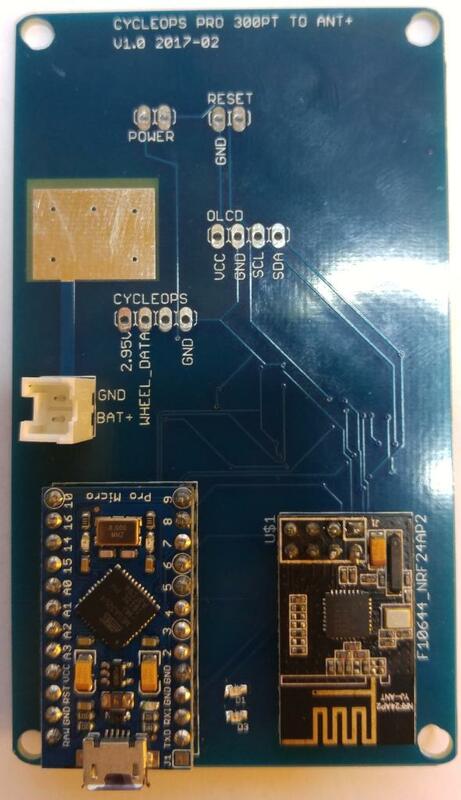 It has incredible view-ability, draws very little power and will run off 3.3V without any external components. It also has really easy to use libraries that made getting the data on the screen very quick to add to the code. 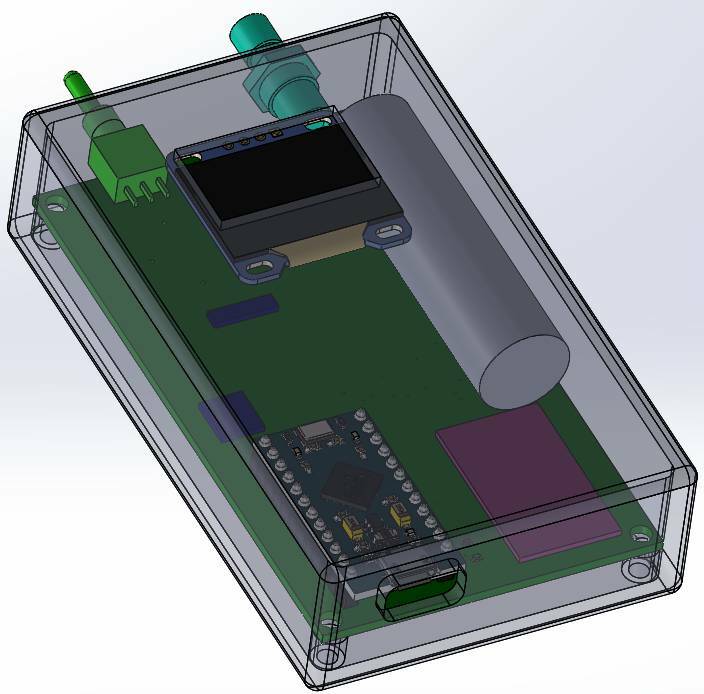 The hand wired unit I built does not have a built in charger but that is addressed in the final PCB design. 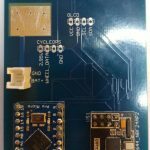 Just as before, the PCB design files and source code can be found in Github CycleOpsPro300PTtoANTPlus. 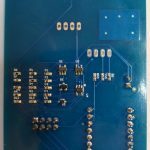 SeeedStudio the PCB vendor I used has a minimum 5 board order so if there is any interest leave a comment below and I’m happy to send the extra to a good home $5 a board. For anything following along at home the ANT+ module I had previously used doesn’t look to be available anymore. 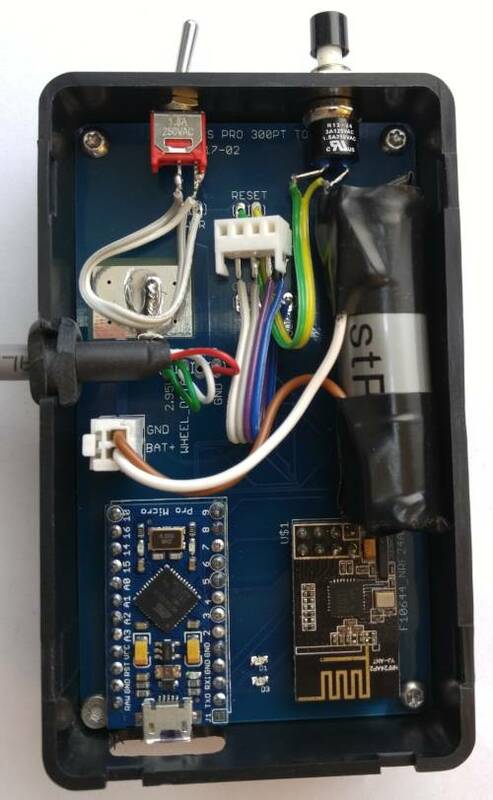 I found one that looks to be exactly the same NRF24AP2 Networking Module / 8-channel / Serial Interface / ANT Networking. This will be the unit I test with the PCB version of the design. 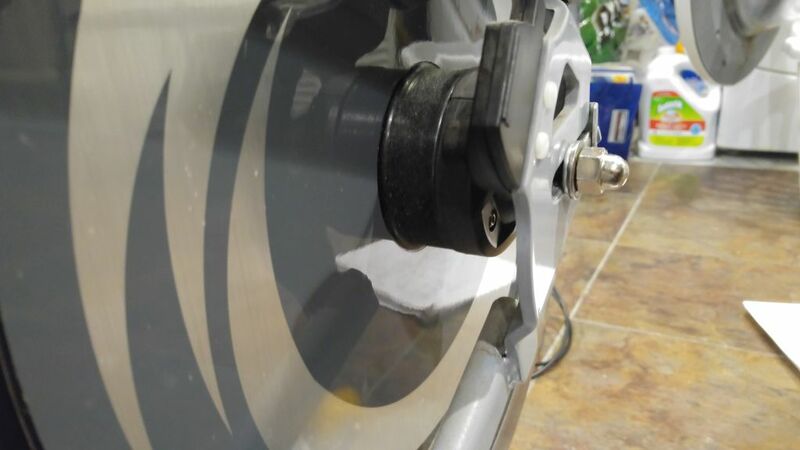 If we can get the torque and get the wheel speed out of the bike we have everything we need. 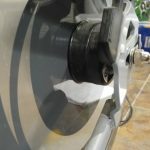 In the very beginning of this project, in a worst case if I could only get the torque, I could always put a magnet on the rear wheel and measure the wheel speed directly to get that part. Being that this bike is close to 10 years old I didn’t want to just trust that it was still calibrated. The best place to hang weights was off the pedals. The crank arms are nicely labeled as being 170mm (I verified they are). Now I needed the tooth count of the crank arm chainring and the rear wheel chainring. I can’t really call it a cassette as this version of the bike behaves exactly like a fixed wheel, no coast at all. 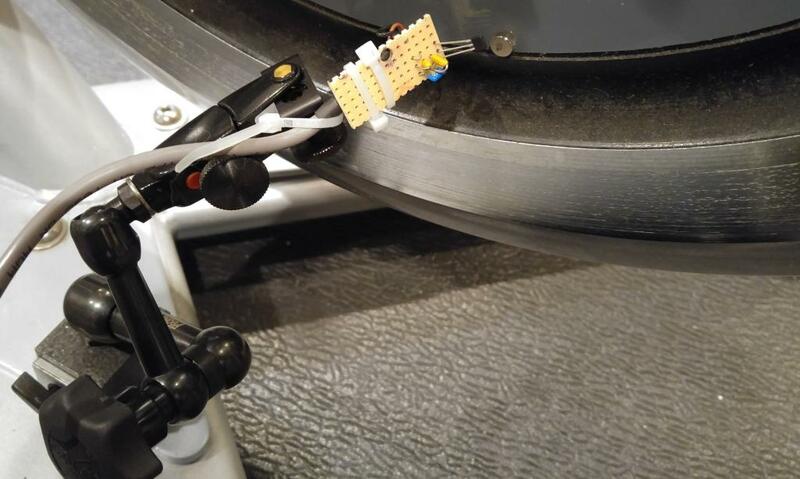 At first I thought this would be a problem but the spin bikes at my gym that I have been using for years are just like this and it’s not a problem at all. Grabbing some free weights and attaching some string made the rest of the process easy. 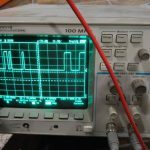 You can see from the last column that the ratio of known applied torque to measured counts output by the hub is very close to 1. This are far from calibrated weights and I would be very happy with an accuracy of ±5%. Given these 3 data points (not really enough but I’ll take it for now). I’m around ±3.5%. One of these days I’ll use a more accurate scale to weight each of these weights to further improve the calibration as well as find some more weight to calibrate at greater applied torques. This would give a wheel speed of 27.8 RPM or a cadence of 7.49 RPM. Since no biker is riding along at 7.49 RPM it seems perfectly fair to call any speed slower 0. Back to the cadence number, since this bike is essentially a fixed gear bike if we know the rear hub (flywheel) speed we can also know the pedal cadence by dividing by the gear ratio. Hence from above 27.8 RPM (flywheel) * (14/52) = 7.48 RPM cadence. This feature of the bike was very nice as it allowed me to easily output cadence over ANT+. One of the metrics I really like to log along with power. 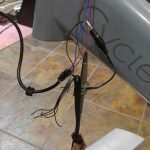 After getting the bike and cleaning it up I started to follow each wire though the bike to identify what plugs into where. 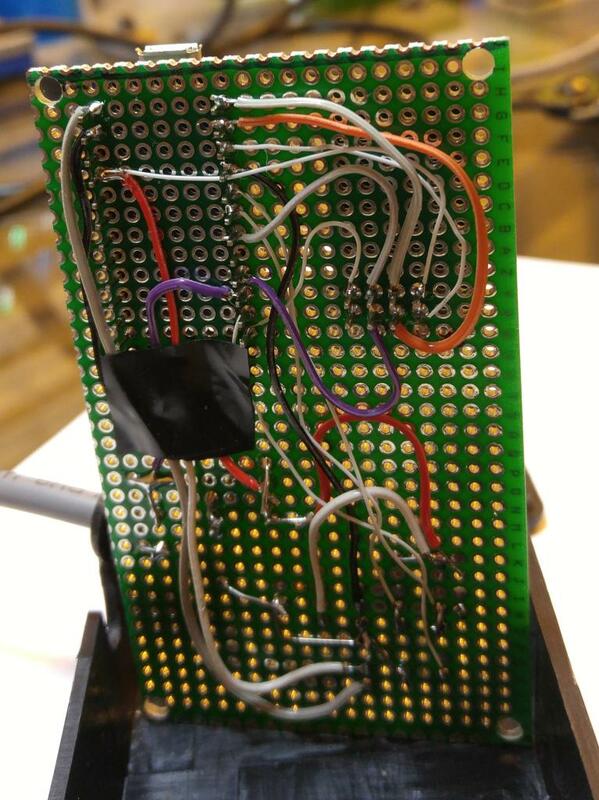 Overall the wiring is really simple. The hub of the freewheel in the back has all of the processing electronics inside of it and 2 AA batteries. I do want to say how useful and downright interesting FCC documents are when first looking at unknown commercial hardware. 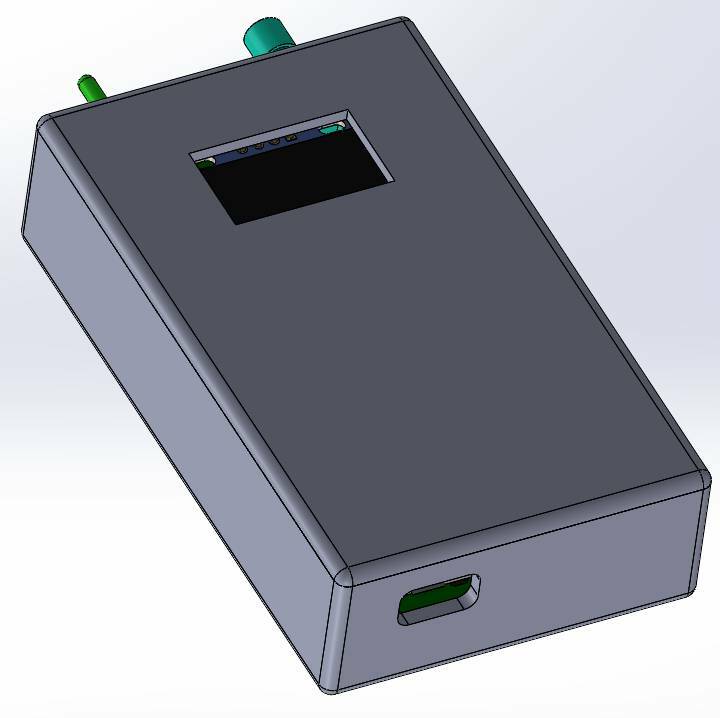 FCC ID T8P-SL2P402 . They also have some great photos of the internals of the torque tube. From the FCC report we can find out that the hub is using 2.4GHz (same as ANT+ but this isn’t ANT+) but most likely back when this was build in 2007 they hadn’t yet figured out how to get the transmission power needed to get the range while keeping power consumption to reasonable levels (totally my guess). So they went with the approach of putting a receive very close to the hub to relay the data back to the head unit. 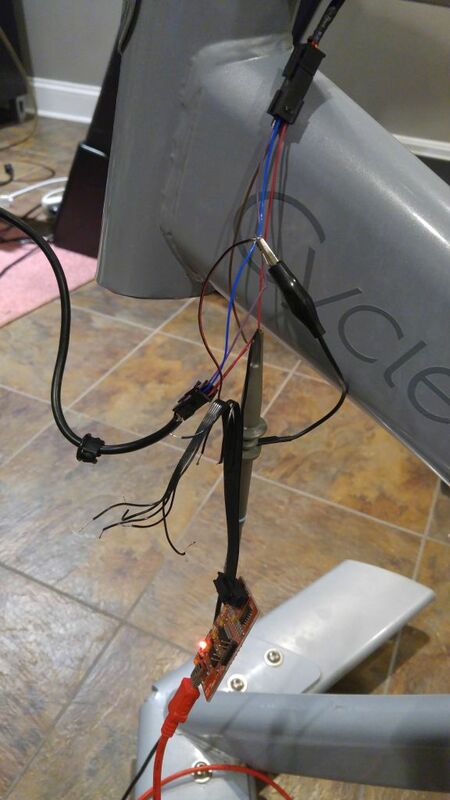 My guess is this exact same protocol was used on the early wired PowerTap hubs. I’ve done enough work with digital circuits and your run of the mill digital communication protocols to have some idea what to look for but this was my first time going in with no idea and no documentation to turn to for reference. The first 2 days was spent just watching as I applied force to the crank without turning, then letting the cranks spin with no force applied just to see how the signal changed. I started by thinking it was just your run of the mill asynchronous serial. 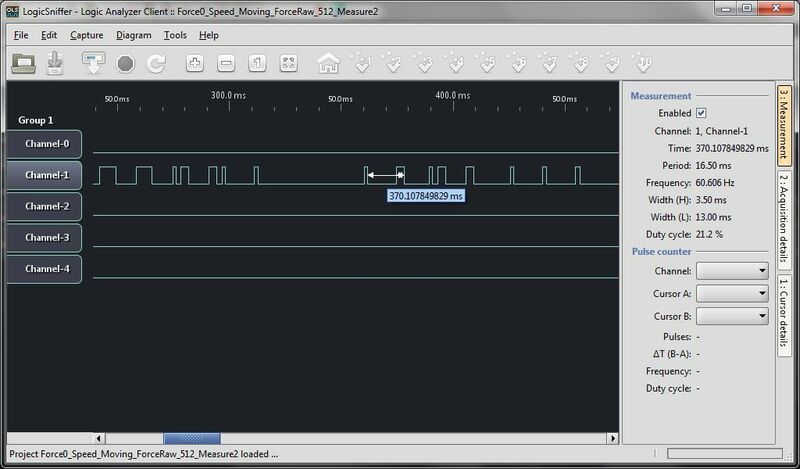 I found the shortest pulse in any given chain 1.535ms and assumed (1/0.001535) = 651.4, call it 650baud rate. 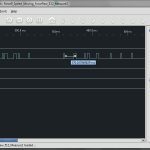 After trying this and other with every combination of data bit, stop bit and start bit I quickly came to the conclusion this was not right. There really were no start or stop bits. The great discovery was that the starting pattern told me everything. 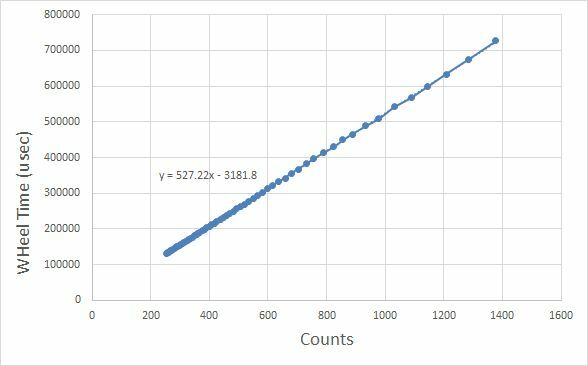 I doubt the method I came up with is the most elegant way to work with this data but it worked for me. I’ve been telling myself I’m going to document this project for others. So here is the start. Source code is posted to GIT hub and when it’s not almost midnight and I have some time I’ll post how this mess of code (but working) came to be. For now some random photos of the early setup that got me a working prototype. I’m going to try to use this word press site as a way of documenting my projects. First step find a good location to post ZIP files for all the PCB circuits (eagle CAD) and other file types that wordpress doesn’t seem to support. I could try to use my dropbox account but I would end up just deleating the files at some point later by accident.